Hard drive failures are possibly the number one reason for lost video in the surveillance industry. What is the average number of years a hard drive in a surveillance system lasts until it fails? What are your most common causes of hard drive failures? The majority of respondents answered three or four years, with two and five years also having a solid showing. Answers of eight and ten were definite outliers in this survey. 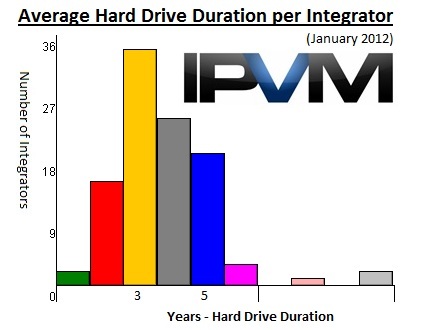 Looking at these numbers, the average hard drive should be expected to last between three and four years in video surveillance applications. By far, the most common reason given for hard drive failure was heat, with 42 mentions in integrator responses. This may be linked to normal use, improperly ventilated enclosures, or lack of maintenance. Integrators commented that some DVRs/NVRs are poorly designed in regards to ventilation, exacerbating hard drive issues. This number also reflects upon the importance of regular maintenance. Something as simple as blowing dust out of PC fans on a regular basis could easily extend hard drive life. Second most commonly cited were power issues, such as spikes, sags, and failures. We touched upon this issue in our analysis of UPS deployment statistics, as one of the key reasons for deploying UPSs in surveillance systems. With small UPSs, capable of preventing abrupt power failure to standalone DVRs, NVRs, or servers, available for little more than the cost of a hard drive itself, it make financial sense to supply one with any surveillance system. "Heat. I find that systems running in hot closets or enclosures will always have issues in the short term." "For our smaller deploys, I suspect improper environment. We have many an installation in rooms that are just too warm or humid." "Heat, by a wide margin - machines stuck in little enclosed cabinets, clogged with dust (or dust glued on by grease, in some restaurant deployments), exhaust fans failing either due to age, or to dust... the list of root causes go on and on, but ultimately, heat is the enemy. I've lost a very few to power surges, lightning strikes, physical damage (machines getting kicked, dropped, smacked around)." "Heat. My #1 peeve is a client who will spend $100,000 on a video platform and won't properly control the climate that it's stored in." "We find most of our problems come from DVR's not being on battery backups. Since the data is writing constantly any spike in power can cause an issue. Other issues we find are that some DVR's do not get adequate airflow which causes the hard drives to run very hot and fail sooner." "Over-heating. Many times our equipment is not placed in cooled IT rooms. Some smaller businesses don't even have IT Rooms."